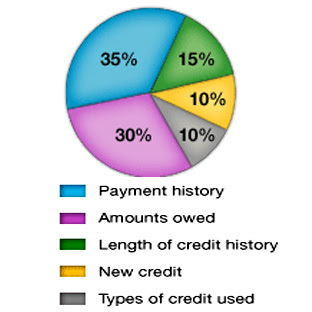 Kitchen and Residential Design: What on earth is in my FICO Score anyway? My car insurance premium just went down. It was a nominal decrease, but I'll take what I can get. I called my insurer just to make sure that it wasn't a mistake and the customer service rep chirped that my FICO had gone up and my rates dropped accordingly. I still fail to understand the connection between my credit rating and my car insurance rates, but I'm sure there's an actuary somewhere who can prove that the two things are related. And I'm equally sure that when presented with this evidence I'll dismiss it. Anyhow, the whole thing got me thinking about the FICO thing. He found it on a website called MyFICO.com. Check it out.